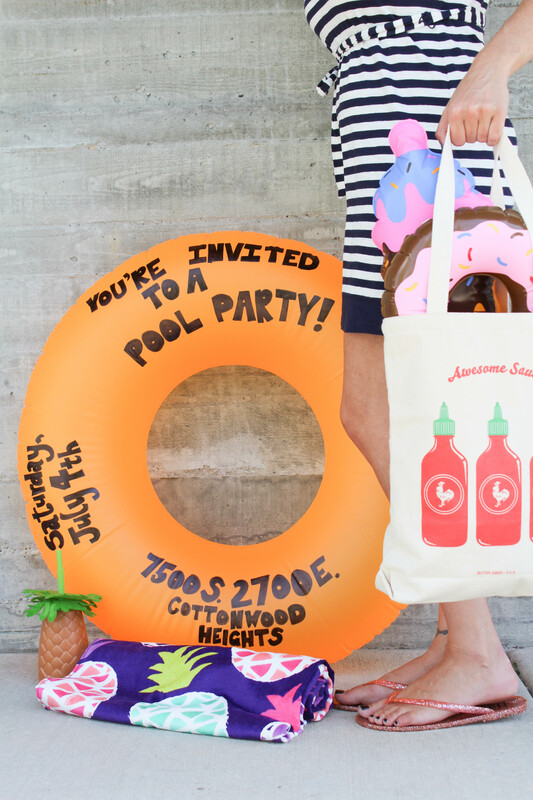 Tis’ the season for beach towels, strawberry daiquiris, pool parties and sunscreen (Nope…scratch that. Wear sunscreen all year people). Oh, and pool floaties. 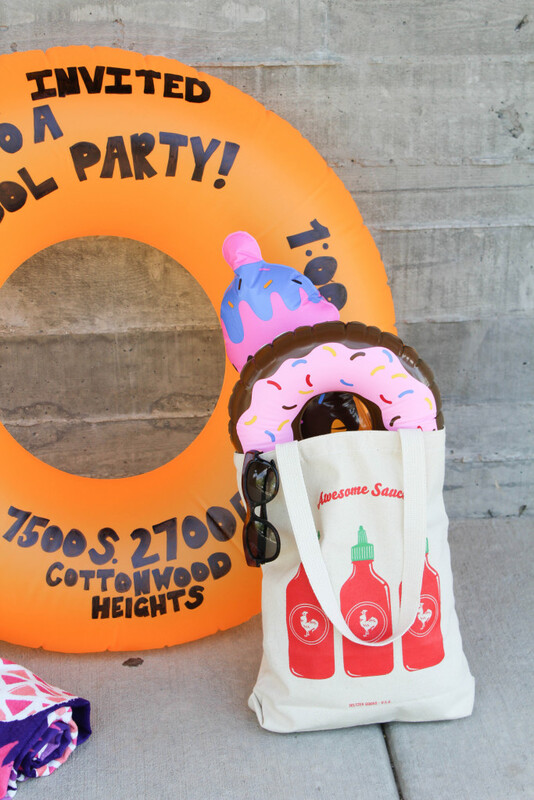 It’s also the season for the cutest pool floaties around. Have you guys seen the Dots box floatie?! (You can find it here). It’s on my wish list. If anyone wants to send that my way, there will be zero complaints coming from me. The world seems to be in a mad dash to photograph themselves with the next best floatie on the market and I’m definitely hoping it doesn’t end soon. Where are the cactus and pineapple floaties when you need em’? (I should definitely get a cut when they get manufactured, just sayin’). 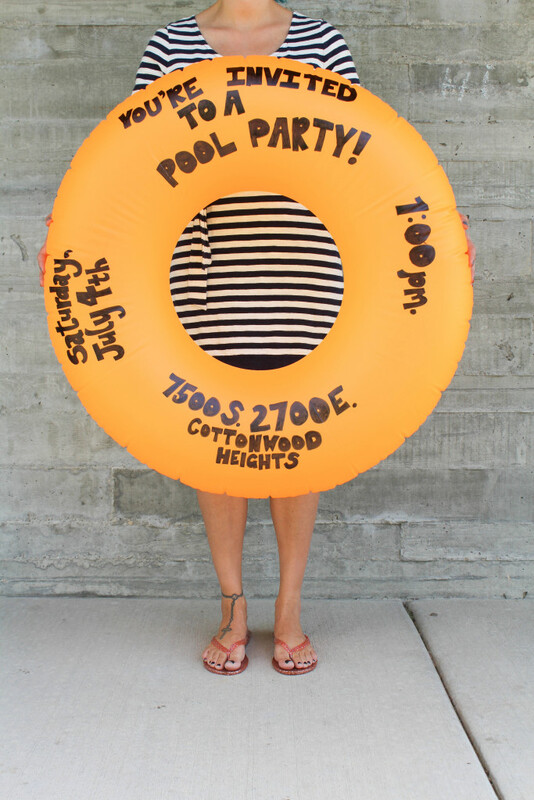 And what’s the next best thing to a fun floatie…? Frozen cocktails. A pool party. 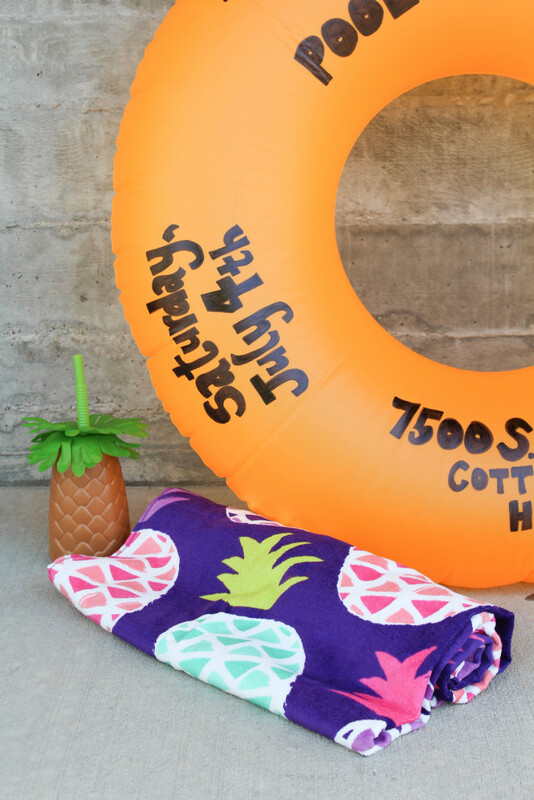 Jump on the floatie bandwagon and invite your guests to your next pool party bash with, what else, a DIY pool party float invitation! I’m a HUGE fan of unexpected party invitations and this one doesn’t disappoint at all. I know I’d be a happy camper if it arrived in my mailbox. The invite couldn’t be simpler to make and you only need a few items to do it. First, blow up your floatie. Yep, definitely the worst part. Once inflated, write your party details onto your ring using a sharpie. 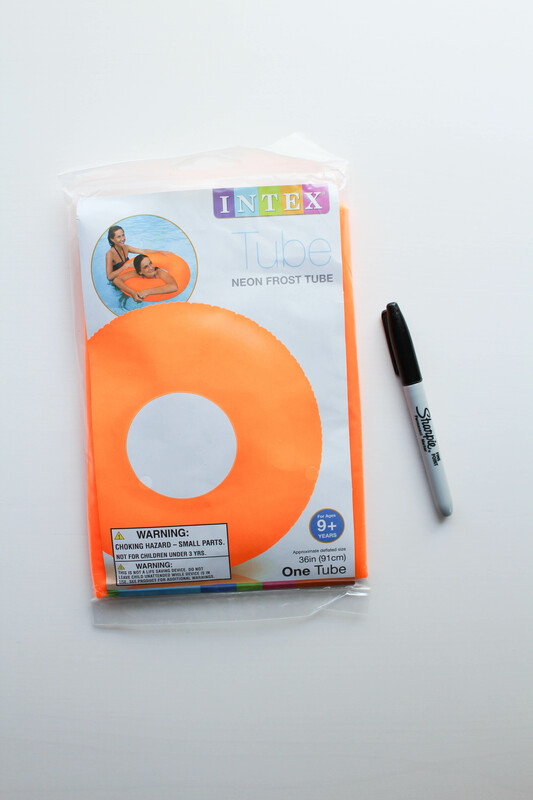 I stuck with black, but you can use any color that will show up on your tube. Be careful not to smudge your writing while it drys. The sharpie ink will need to set for a few hours. (I let mine dry overnight). Once dry, remove the air from your ring and fold it back up, so that it will be small enough to fit into your envelope. 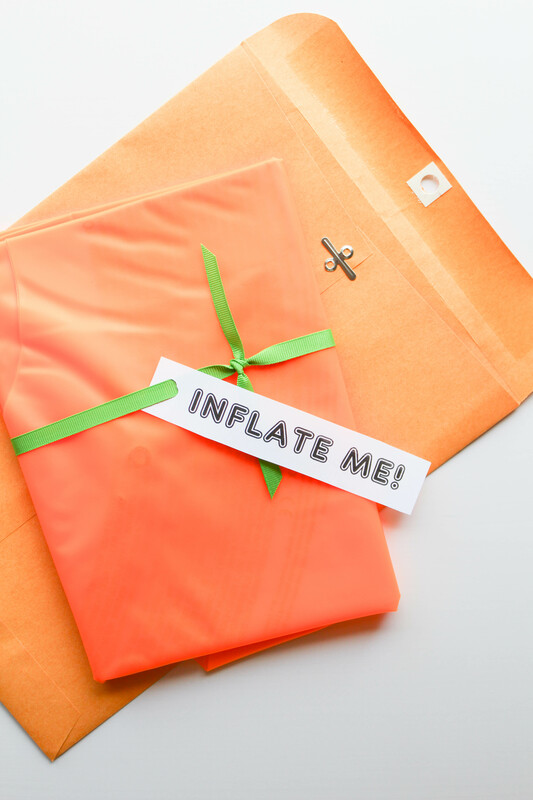 Create and print a small tag on your computer that says “Inflate me!” (I just made mine in Word). Tie it around your folded floatie with ribbon. Insert into your envelope, address it to your party guest and mail it! Once your guest receives and opens the package, they’ll be instructed to inflate the tube, and will see that it’s actually a party invitation once they can read the details! 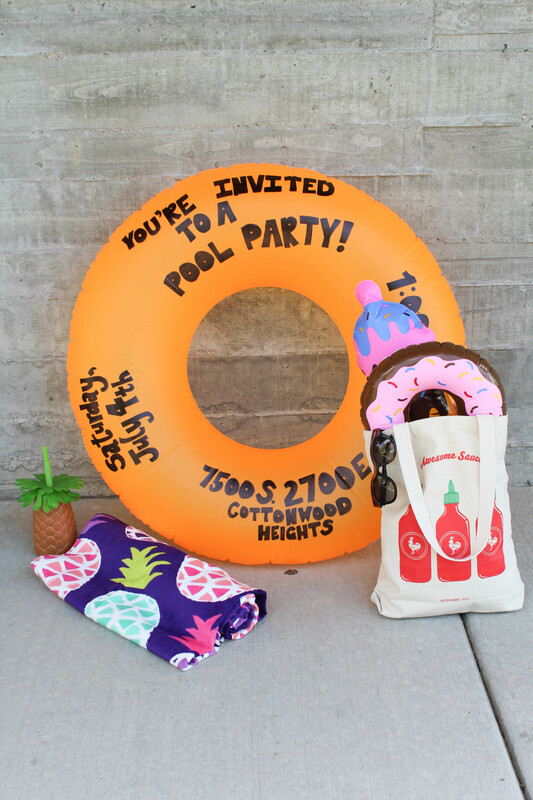 This DIY pool party float invitation is so simple and such a fun surprise for your friends or family to receive in the mail! Plus, they can bring their floatie to the party too! Will the markings stay in the pool or will they come off with the chlorine do you think? I want to know where you got that cute bag and mini floaties? So adorable including this invite idea, so cool!